Did BP Unleash A Zombie Bacteria? People along the Gulf Coast are still reeling from the horrors of the Deepwater Horizon Oil Spill of 2010 that destroyed a British Petroleum oil rig, killed 11 workers and gushed unchecked for 87 days unleashing an estimated 210 million gallons of crude oil into the gulf and adjoining Atlantic Ocean. 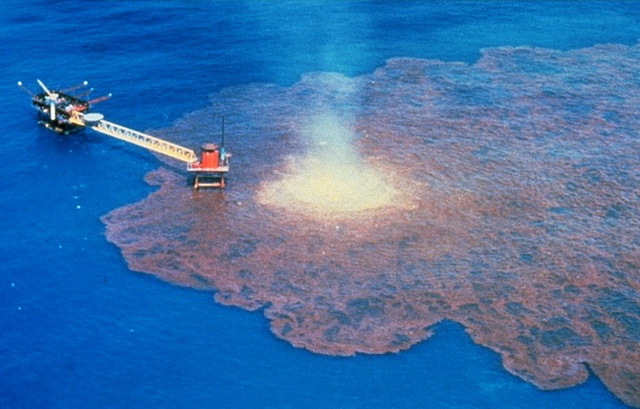 All of the usual methods of collecting and removing crude oil from ocean waters and the coastal regions were put into play and British Petroleum dropped nearly two million gallons of Corexit oil dispersant that they said would break down the thick crude oil into small particles making it easier to remove. What we didn’t know then and are only beginning to learn about now is that BP, in conjunction with Synthetic Genomics Inc. of Rockville, Maryland, was also adding a newly created and experimental synthetic bacteria code-named Synthia that was designed in the laboratory to feed on crude oil. The Synthia bacteria was an apparent spin-off of research by Synthetic Genomics, a subsidiary of BP that was engaged in creating a man-made bacteria that would break down the heavy viscosity of crude oil and make it easier to find and remove from deep in the earth. The genetic engineering for BP was headed by J. Craig Venter, one of the researchers involved in the Human Gnome Project. While reports are conflicting there is a general sense that in the corporate haste to “fix” the terrible mess the Deepwater Horizon disaster created, the company released an untested zombie bacteria that not only fed on the dispersed oil but mutated to feed on other and possibly all forms of organic life in the ocean. It is true that since the BP disaster dead sea life has been found off the coasts of the Gulf and along the Florida coast of the Atlantic Ocean. Not only sea life but thousands of birds that feed on coastal creatures are falling dead of an “unknown disease.” At least one swimmer has died this season of a skin-eating bacterial infection and others have been treated for extreme sores and rashes after swimming in these same waters. One Internet report suggested that people caught in heavy rains with water drawn from the Gulf of Mexico are coming down with itching sores that quickly feed like a cancerous wound that eats them alive within days. The story said “restrictive measures” have been taken by the U.S. government to prevent information about this horror from spreading. We suspect this report is exaggerating the truth behind the Synthia bacteria. Such extremes just can’t be true. It was back in 2010, the same year of the BP disaster, that researchers working with Venter announced the creation of artificial bacteria through genetic engineering. It was the literal creation of a new life form by humans. They said the project was the result of 10 years of experimentation by 20 scientists at a cost of $40 million. Critics even then worried that artificial organisms like this might escape into the wild causing environmental havoc. They suggested that such things would just as easily be turned into biological weapons. The Deepwater Horizon explosion occurred in April of that same year. Did BP link up with Craig Venter and create Synthetic Genomics as a result of the terrible oil spill? Was there a secret rush to create and utilize a custom-manufactured bacterium that would “eat” the crude oil without taking time to test for potential environmental consequences? At first the experiment seemed to work. After Synthia was released into the Gulf waters a company report noted that researchers were "impressed by the speed with which the bacteria was consuming the oil." The problem, however, is that this bacteria also may be capable of growing and replicating. If true, mutation was indeed possible. Are the scary Internet stories true? Has BP created a monster bacteria that has the potential of consuming all living things on the planet? Has this company released a real Frankenstein monster that is so small it cannot be seen, but it silently kills after contact? If this is what is really happening, it won’t be long before the truth is told.